All of us in the Accountant Advisory Group at Intuit® Canada are excited to share a big announcement regarding the new QuickBooks Cloud ProAdvisor® Program. This new, reimagined Cloud ProAdvisor Program is designed to truly help you grow your practice and better support your clients! New portal. Built-in access. 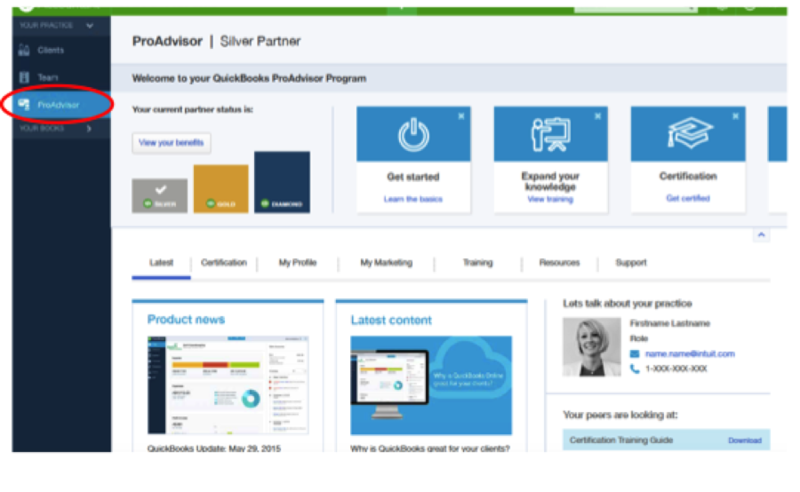 The new Cloud ProAdvisor Program portal is built right into the new QuickBooks Online Accountant, giving you one-click access to all your ProAdvisor benefits. That’s not all! There are two ways to unlock even more benefits. Now, you’ll be able to unlock new benefits by getting certified or by adding QuickBooks Online clients to your practice. It’s simple; the more QuickBooks Online clients you add, or the greater level of QuickBooks Online certification you achieve, the higher your membership level within the program. Distinct, redesigned badges will also be available for download soon, making it easier than ever to showcase your expertise and stand out from the crowd. For a complete listing of all the great new benefits, log in to your QuickBooks Online Accountant product (available after Aug 28, 2015).